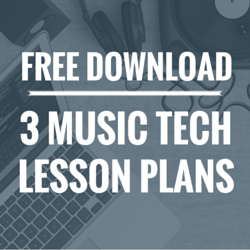 This is the first of a new ongoing series of more “formal” lesson plans that suggest simple ways to incorporate technology into music lessons. 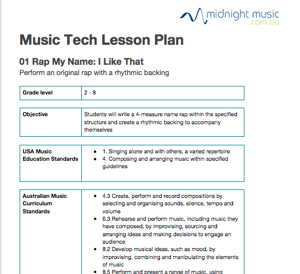 I’m aiming to map each lesson to the US and Australian national standards for music education (UK coming soon too!). I’d love to know what you think about that idea: is it useful for you? What types of things would you like to see? Leave a comment below letting me know what you think. 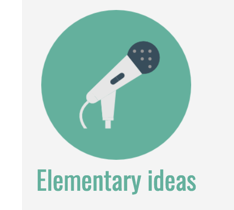 This lesson plan works well with grade 2-8 and can be adapted in many ways. It’s a good activity for the beginning of the year when you’re trying to learn new students’ names! 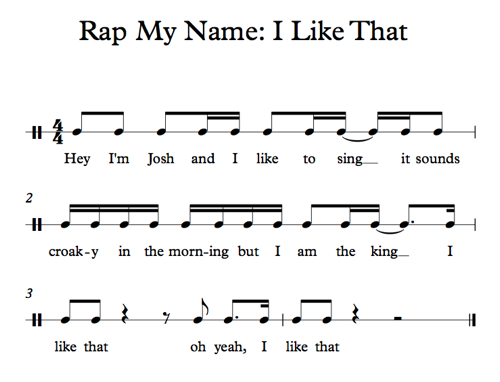 Students will write a 4-measure name rap within the specified structure and create a rhythmic backing to accompany themselves. As a group, keep a steady beat using body percussion. 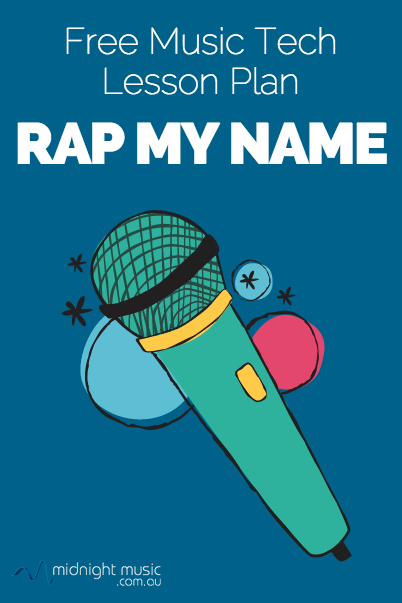 Practice saying the name rap over the steady beat – use the samples below or ask students to make up their own. It makes me happy, so what you gonna do? 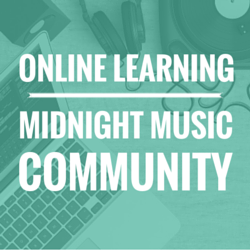 Using your chosen music software, app or website, create an 8-measure rhythmic accompaniment to go with the rap. Note: 8 measures of rhythmic accompaniment will give students a two-measure introduction before they start rapping, and a two-measure outro at the end. Start the rhythmic accompaniment and after two measures, start saying the rap. There will be a two measure outro at the end. Video-record the student performances using a Smartphone, iPad or other tablet or camera. If your music software/app allows, add an audio track and record the rap part over the backing. Other instrumental backing parts can be added as well: bass line, keyboard part, strings and so on. Notate the rap using stick notation: use pencil and paper, notation software such as Noteflight, Sibelius, Finale or MuseScore, or apps such as NotateMe or Notion (Noteflight is also an excellent choice for iPads and other tablets). The students can successfully perform their name rap over the top of their rhythmic accompaniment. 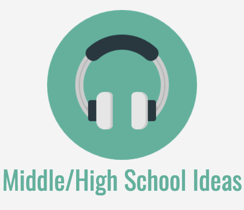 Would you like a downloadable copy of this lesson plan? 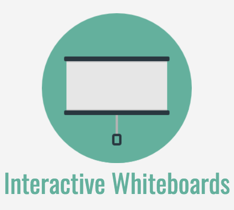 Click on the button below, fill out your details and the lesson plan will be sent straight to your email inbox. Thanks for this, Katie! I think my students will have fun trying this out for a beginning of year project. You inspired me to try making my own sample one with Soundtrap, which I’ve been meaning to explore for ages! I’m pretty happy with how it all went. I teach many kids who are very reserved and it’s often difficult to get them making their own sound. I’m hoping this project, which I’ll let them record privately, will help them get past their inhibitions. You’re welcome Wendy! Happy to hear you’ve been giving Soundtrap a go. I need to play with it more too. One other thing that helps shy kids: once they’ve recorded their voice part, they can add an effect to the track to alter the sound a bit (if your software/app has that option). You can make the voice sound a little distorted or like a chipmunk or like it’s in a big room, or apply an autotune effect etc. Applying an effect disguises the voice enough that they feel less self-concious. Hi Katie – thanks so much for this resource – the kids will love it! I’m having trouble downloading the full lesson plan. I’ve tried to download it to 2 different email addresses but still haven’t received it. Would you please be able to email it to me when you get a moment? Hi Lisa. Sorry to hear you’ve had trouble. I’ve just sent it to this email address, so hopefully you’ll receive it OK. I can’t wait to try this with 6th grade students on Monday! Thanks Sara 🙂 Let me know how it goes if you try it. Thank you so much for this fabulous integrated lesson! I look forward to trying it out with my junior students this fall. Thanks Jen! I’d love to hear how it works out with your students. This looks like the perfect lesson plan for my students who have been working on name chants. 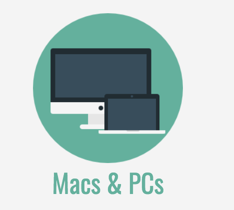 Adding in the tech aspect to their lessons will greatly enhance their learning experience. I’m having trouble downloading the lesson to my email address so any help would be greatly appreciated. Thank you! Hi! Cool audio of the student’s work. 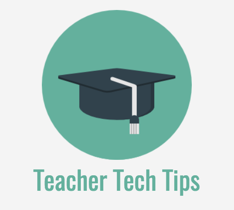 How long does it take to get the downloadable lesson plan after clicking the button? Hi Jan – thanks so much for writing to let me know that it worked. That’s so good to hear! This is exactly the type of thing i need. 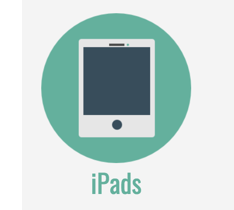 Step by step and how to introduce concepts to students and use 1:1 iPads. In general people mention apps that are good but there is no “how to” on actually using it. I can search all afternoon about various things to use but it is hard to implement them directly into a lesson or theme without a plan! I hope you have more of these….this is what I need! Thanks Sharon! It’s always that type of information that I’m looking for too and it’s very difficult to find anywhere. That’s why I started created lesson plans and project ideas myself. If you’d like more lesson plan ideas, I have a collection of 22 (which have written instructions, but also videos as well) in the iPad Projects For The Music Classroom ebook. Thanks Katie. We have one ipad for the class. This is a great way to make it work for everyone. Thanks for doing the hard work of putting in the learning standards! Hi Katie! 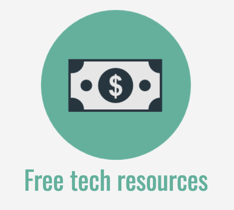 I am working on a grad class in technology, and I appreciate that you have this lesson as an available resource for my portfolio. Keep up the good work! Thanks for sharing this great idea. I am wondering if you have the rap version loop without Josh? I would like to use the exact music and repeat it for the students. I am having trouble finding a suitable rap back track, and we don’t have garage band. Hi Louise! No I don’t have the backing without Josh unfortunately. Creating the backing is a great exercise for the students to do and you don’t need GarageBand. I would suggest looking at Option 3 above which uses Groove Pizza. Groove Pizza is a free online drum sequencer which works on any device. It’s really simple to use and lots of fun and the students will enjoy it. They just need to set up a pattern on the “pizza circle” (or even use the example pattern that appears when you first go to the website) and then they can rap over that. This looks like a fun and effective lesson. I was planning to do this with my students as a way to start the new year, but when I went to groove pizza I found the playback function wasn’t working. I don’t find any troubleshooting tips online. Have you ever heard of that happening? Any tips would be appreciated. Thanks! No – I’ve never had any issues with playback. 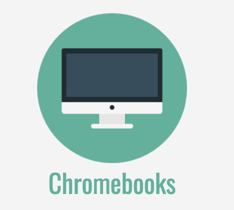 Things you could try: 1. make sure you’re using the Chrome browser (which is best for music websites. Internet Explorer is best avoided!) 2. Clear your cache/history and restart Chrome. One of those might help fix the problem!